This morning in the backyard.A request to eat breakfast outside. 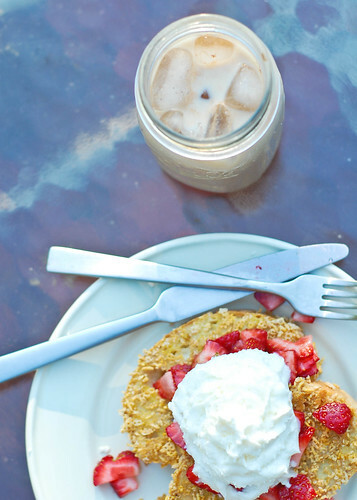 Crunchy french toast with strawberries and whipped cream. Iced coffee yum. Dew on the grass. Chilly enough to warrant jacket requests from the kids. Relaxing after a weekend of relaxing and cleaning and friends over for last minute dinner because their power was out and real big kids beds for the little ones. *Posting may be sporadic for a bit. Computer issues with slow, old computers = it’s hardly worth the effort of uploading photos. Adding trying to deal with Lightroom + Slow computer…FUHGHETTABOUTIT! I have a few posts to do to catch up on happenings, but otherwise not a ton of new for a bit. Just a heads up! Hang around, please? I like you guys:) Feel free to visit me on Flickr to see my crazy backlog of photos I haven’t gotten around to posting about!